This new treatment from Pantene Pro-V promises to tame the frizz for up to 24 hours with a non-sticky formula. Well, it pretty much does what it says on the tin. THE END. OK, not really the end… that would be a speed review and a half. There’s a teeny bit more to this new hair release than meets the eye. 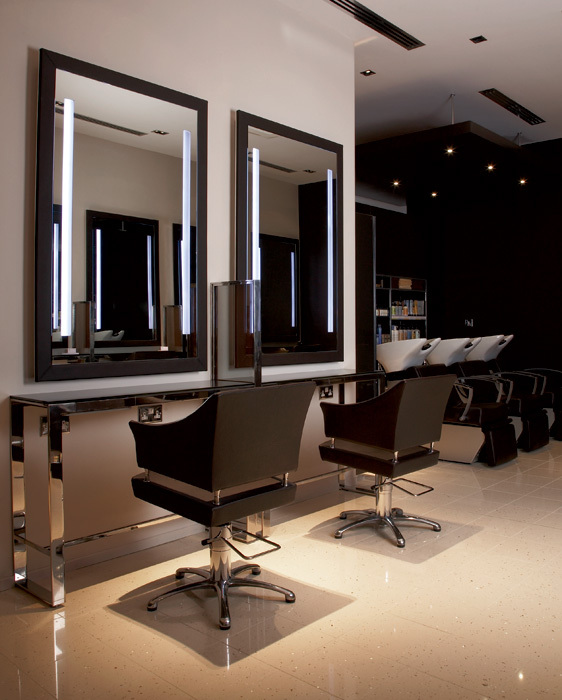 Pantene asked one of the top UK Spas (Stoke Park Spa by SPC) if they were willing to embark on a little experiment with them. It involved a blind test… you know the deal, get in some guinea pigs – give ’em the posh cat food hair treatment and then give ’em the high street alternative. Well, the punters couldn’t tell the difference between the Pantene range and the £60 spa treament and neither could the expert stylists. 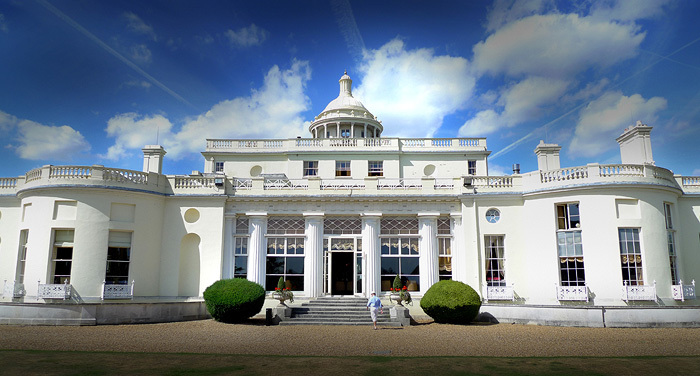 Stoke Park Spa by SPC, when I die… I’d like Heaven to look a bit like this. But what does this have to do with the Pantene Pro-V Smooth & Sleek 24h Frizz Fighter? Well, the range that was put to the test was indeed the Pantene Pro-V Smooth & Sleek line up which now comprises of 4 ‘spa-endorsed’ products. The Pantene Pro-V Smooth & Sleek 24h Frizz Fighter feels more like a leave in conditioner in texture when compared to something like John Frieda’s iconic Frizz-Ease serum. 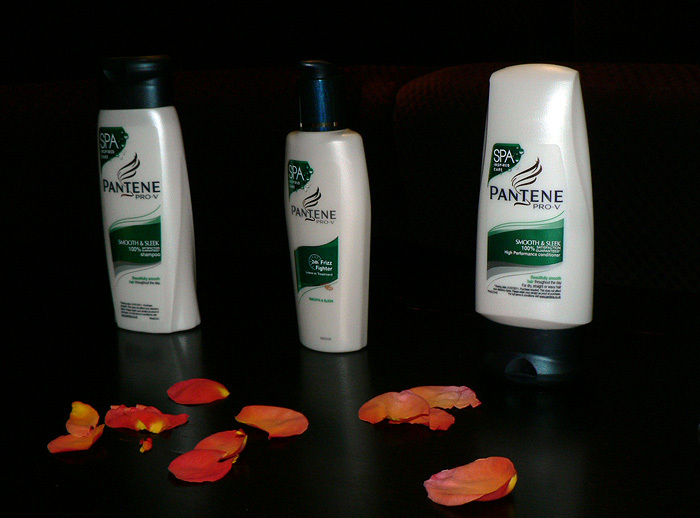 I’m a fan of both but I like the lighter texture of the Pantene for my fine hair. I have to be very careful with the Frizz-Ease not to overload and the Pantene certainly seems to be far more forgiving. 9/10 cats couldn’t tell the difference between the salon at Stoke Park Spa by SPC and my bathroom. And the results? Well they’re GOOD! Whether I leave to dry naturally or blast with a hairdryer (whilst trying to flatten the hair cuticles of course) I achieve smoother locks. I still have the odd flyaway near the roots but running my fingers through the ends of my hair confirms that the entire shaft is smoother, not as rough which as you can imagine results in an overall sleeker do! Pantene Pro-V Smooth & Sleek 24hr Frizz Fighter is available at Boots and the other usual outlets! I love the Stoke Park Club! We used to live nearby and I loved eating lunch on the terrace.